Edgar Allan Poe’s infamous poem “The Raven” was published on 29 January, 1843. There is, perhaps, no other single piece of writing in Poe’s life and work that helped to catapult him to fame, to make him a “rock star”,than that one poem. The narrative poem was first published in the New York Evening Mirror. It was immediately pirated and printed in dozens of other newspapers and periodicals across the country. Soon, everybody knew Poe, “nevermore” and the raven, but it didn’t improve Poe’s bank account a penny. The lyrical, melancholy poem was so ubiquitous in Poe’s lifetime, that it is said that when Poe walked down the streets of New York, children would “caw caw” after him, and christened him with the nickname ‘The Raven”, make poet and poem synonymous. The poem was actually rejected by a couple of publishers before it landed, under Poe’s name, in the New York Evening Mirror. Poe contemporary and friend Nathaniel Parker Willis, the editor of the Mirror, wrote that the poem was “unsurpassed in English poetry for subtle conception, masterly ingenuity of versification, and consistent, sustain of imaginative lift…It will stick in the memory of anybody who reads it.” Sounds the perfect 19th century ear worm. Poe’s poem, with no intentional allegory, which tells the tale of a lonely, grieving student visited by a talking bird. It was inspired in part, by Charles Dickens’ pet called Grip. Grip died just a few weeks Dickens wrote his friend. Poe, fascinated by Dickens’ raven, at first considered a parrot as the fowl to be featured in his poem, but went with the much mor dashing and mysterious raven. Lucky for all. Edgar Allan Poe’s poem “The Raven”, if Poe and poetry are still taught anywhere in American schools, is at the top of the list of assignments. The poem has been copied, imitated and parodied. Actors have recorded the poem and musicians have been inspired by it since its debut. It is often the first work people think of with Poe’s name is mention. The black bird’s plaintive croak of “nevermore” is indelibly associated with Edgar Allan Poe. In fact, the first filmed biography of Poe, made in America in 1915 is entitled “The Raven”. The Poe still inspires and still speaks to us, its power as strong as when it was first published. We are are proud to debut this new recording by actor and composer Jennifer Rouse. The female voice adds a new, wonderful dimension to this ever-living poem. 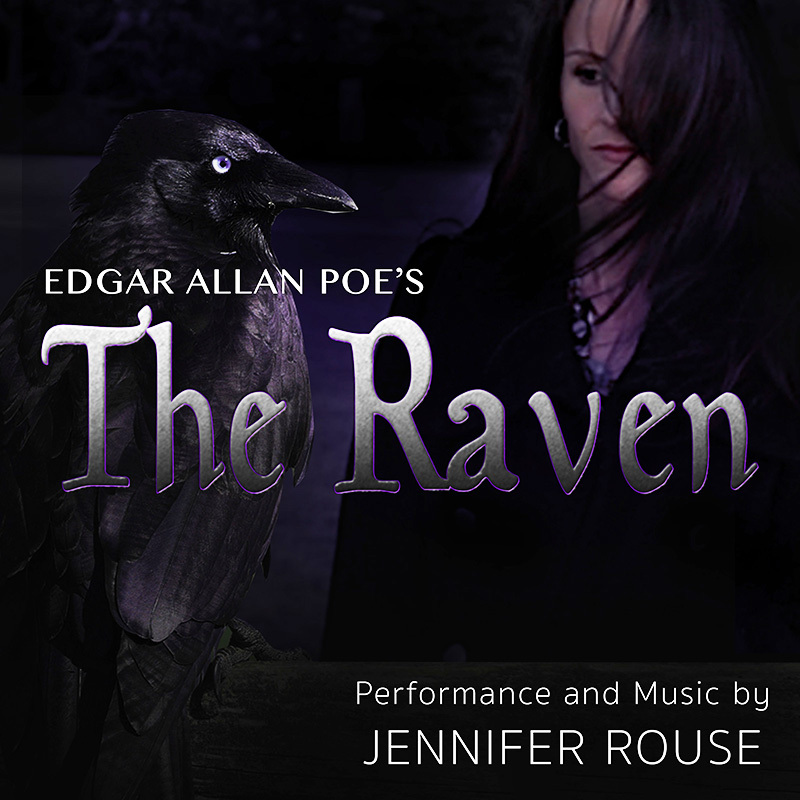 Rouse’s performances strong and lyrical, and her music is a fine underscore to Poe words.